I married a serious lentil lover. I think, if he could, Damian would eat this soup 3-5 nights a week. He requests it constantly, and lucky for him it’s an easy make. Unlike a lot of soups, this one comes together in well under an hour. It’s a super-hearty, super-healthy, and many many levels of delicious. Dice the veggies and sauté the mirepoix, garlic, and olive oil in the bottom of a soup pan. When onions are glassy, add the bay leaf and spices and continue to sauté another few minutes. Add the lentils and stir them into the sautéing veggies. Keep stirring them around for about 2 minutes (add more oil if needed). Add the tomato and broth, reduce heat, cover, and simmer for an additional 20ish minutes, until lentils are tender. Before serving, stir in the spinach and vinegar. Spice as you wish. Serve steaming in an old chipped mug, with a huge hunk of crusty bread. this finally got me inspired to make some Homemade stock/broth that you put the recipe up for. The results were a bit meh for me tbh, probably becuase I guessed the method and didn’t suate the garlic or cover the pot (doh), what do you do with the left over stock veggies? it seems a waste to throw them away. This recipe looks very easy and good, but what is the ingredient after the garlic? You should submit this to WIC! 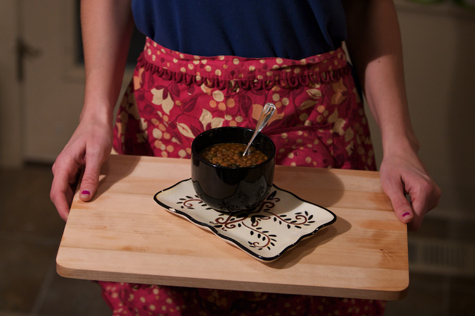 Lentils are one of the foodstuffs given to all pregnant women and their kids and they are always looking for recipes to be dispersed to participants! Some of their recipes are ridiculous because they call for like 10 other expensive ingredients. This one is great- healthy, ethical and inexpensive! @ Kate – I still use and love that mug! It’s the first one I ever bought when I moved out on my own a looooong time ago, ha! And we miss you too!!! @ Sandra – It is! @ Richard – I always use old veggies that I wouldn’t be able to use up fresh (when I get caught with overstock), so it doesn’t feel like a waste. I compost the veggie mush when I’m done. Sautéing is important because it adds fat, which gives the broth that extra richness and depth. @ Marcus – Fixed! Thanks! @ Julie – Really? That’s awesome that they’re giving out lentils. I should totally submit my recipe! I’ll look into it, thanks lady. @ Salekdarling – Did you make it? How did it go?? Made your recipe last weekend and we loved it, loved it, loved it! Thanks ever so. Hi – do you use dried lentils for this recipe (I could only find canned ones?) and do you need to soak them beforehand? 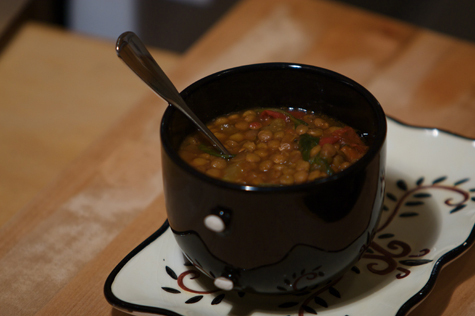 @ Natasja – I used dried lentils, but I think you could use canned. I’ve never worked with canned but I’d assume they would be fine. You’d probably need to cook them for less time. Luck! Made this soup this afternoon & loved it! I also took your advice & enjoyed it with some crusty bread, but didn’t have the same authentic experience with a cracked mug. Thanks for sharing this! I just made this and my 3-year old shoveled it in, gushing – “This soup is so very good, mama! I love the lentils, and I just really love the carrots.” I’m not a celery fan, so I left that out and upped the carrots and onion. I also added fresh mint at the end. YUM. This will definitely be in our recipe rotation as the weather cools. Thanks, Sayward!